If you’re a demanding driver who craves to drive a curb hugging coupe that responds to your every touch, you’ll be thrilled with the all-new 2018 TT RS Coupe. It is performance driven and an uncompromising combination of the TT with the RS. The 2018 Audi TT was already an amazing car, but with the increased sports performance, the TT RS takes everything one step further creating a powerful coupe that is hard to beat. After a five-year hiatus, the 2018 Audi TT RS is back and better than ever. Every single detail on the 2018 TT RS was designed to perform better. This coupe was born to drive, especially considering it features Audi’s award winning 400-horsepower engine. The moment you’re seated in the driver’s seat you’ll never want to get out. All you can do is hold on tight and enjoy the ride. The 2018 Audi TT RS is available in only one outfitted trim level, though there are a variety of packages available to add including: Technology, Audi Sport and Black Optics. For more information, check out the all-new 2018 Audi TT RS at Southgate Audi in Edmonton. There is no better engine to put under the hood of the 2018 Audi TT RS than Audi’s 5-cylinder spark-ignition DOHC engine with gasoline-direct injection. Winning international engine of the year for 7 years running, this engine is turbocharged and features an intercooler. 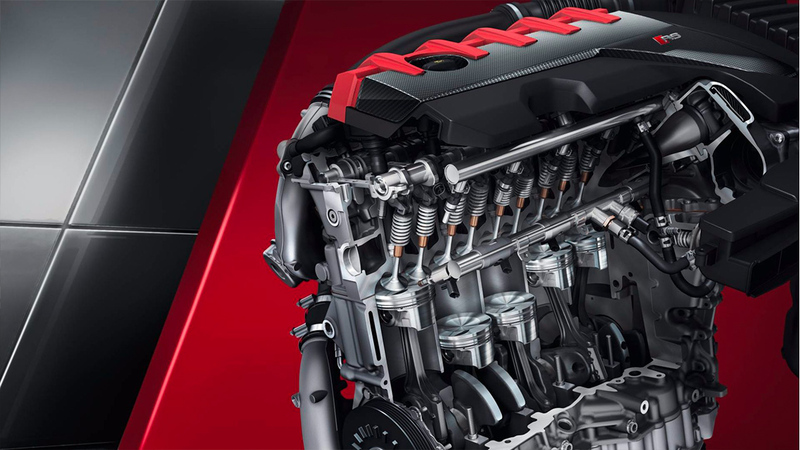 With maximum outputs of 400-horsepower and 354 lb-ft of torque you’ll feel the power under the hood in this engine. The TT RS wouldn’t be what it is without the ability to accelerate from 0 to 100km/hr in 3.7 seconds, with a maximum speed of 250km/hr. All this power needs exceptional handling and that is why the 2018 Audi TT RS has a 7-speed S-tronic gearbox and RS-tuned quattro AWD. It is powerful performance that handles seamlessly. For Audi, RS stands for “Racing Sport”. This is encompassed in the 2018 TT RS where sport details are everywhere. The single frame honeycomb grille has aggressive air intakes which complement the powerful engine. The rear spoiler executes both functional and aesthetic operations. But that’s not all, because the 2018 Audi TT RS was designed to go above and beyond. The standard LED headlights save energy while producing great light. 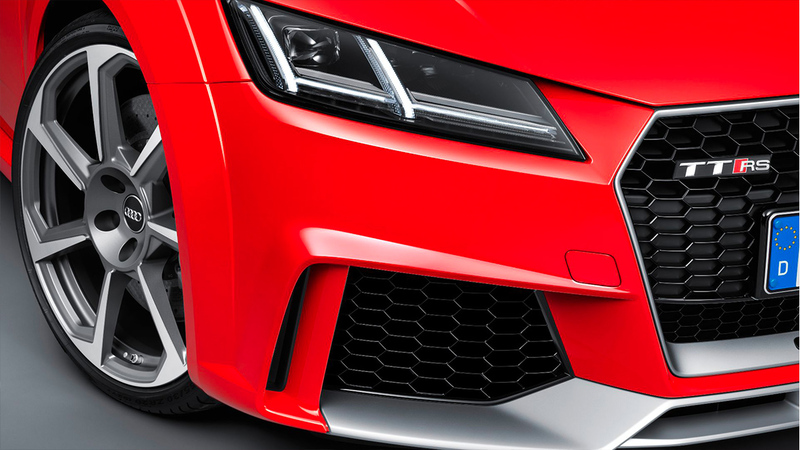 With available colours like Catalunya Red Metallic and Glacier White, the Audi TT RS is designed to stand out. You can’t forget the available 20-inch wheels either, they complete the look of this sporty coupe in Edmonton. Audi designed the 2018 TT RS to be the complete experience. The interior is comfortable and outfitted in the latest vehicle tech. Audi’s MMI Navigation Plus comes standard which is key to knowing where you’re going. You can operate everything through a central rotary and push button style control. SiriusXM satellite radio and Bluetooth capability come standard. You can see all your smartphone information on the Audi Smartphone Interface. To take your listening experience further, the Bang & Olufsen Advanced Sound System is available, complete with 19 high quality speakers. Safety has always been central on Audi vehicles, and even with the performance driven and sporty Audi TT RS you can feel safe. Standard assistance systems include Cruise Control, electromechanical parking brake and rear-view camera. Every TT RS comes with Parking Aid Plus which gives audio and visual cues when parking or maneuvering. For those who want to add an advanced safety feature, Audi active lane assist is available. This tech reduces the danger of departing from your lane. The front mounted camera detects up to 50m of lane markings and other obstacles.